Offering Salon Furniture Salon Equipments Spa Furniture Spa EquipmentsThe company is a renowned name in the field of Beauty Salon & Spas products indulging in Manufacturing, Imports, Exports and Supplies of the beauty trade. We sell good quality professional use hot cabinets for spas & salon. 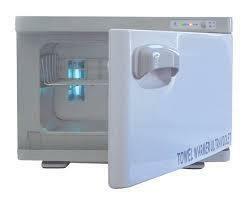 Our towel warmer come with UV Light function. We offer high quality Towel Warmers.Professional Euro standreds, Metal body towel warmer with inbuilt sterilizer.Fuze protector Meas.-57x37x38 cm, G W- 10.8 kg. Single Door, 2 rack towel warmer. With Ultra violet sterilizer inside. The Single-door Towel Cabinets has a capacity of 72, (12" x 12") wash cloths.Rust-proof aluminum interior, maintains an internal temperature of 70~80 degree Celsius. Comes with 2 shelves and a condensation collector tray to remove excess moisture. Silicon door seal is ideal for heat retention and quiet operation. Being a well-renowned entity, we are engaged in providing a distinguished range of Hot Towel Warmer. We introduce ourselves as a leading manufacturer, trader and supplier of precisely designed Towel Warmer. The convenience and comfort of stepping out of a shower, pool or spa and wrapping yourself in a warm towel. Thanks to the wide range of affordable and energy efficient Professional Towel Warmer cabinet / towel warmer available, this comfort is no longer a luxury, it's a practical reality a health standpoint. 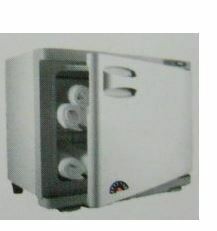 Our customers can avail from us superior quality Japanese Taiji-Towel Warmer and Coolers from us. Owing to the quality of these products, these find high demand in the spa and salon industry. We provide these quality tested high grade products to our customers at industry leading price rates.